If you love climbing mountains, scaling rocky peaks and jumping through mud puddles, the King MT is for you! Named for Kings Peak, one of the tallest and toughest to tackle peaks in the state of Utah, this shoe is ready to dominate loose ground, wet or dry. The Vibram® outsole features 6 mm lugs designed to provide you with optimal lateral breaking, medial gripping and excellent traction in wet, loose or rocky conditions. 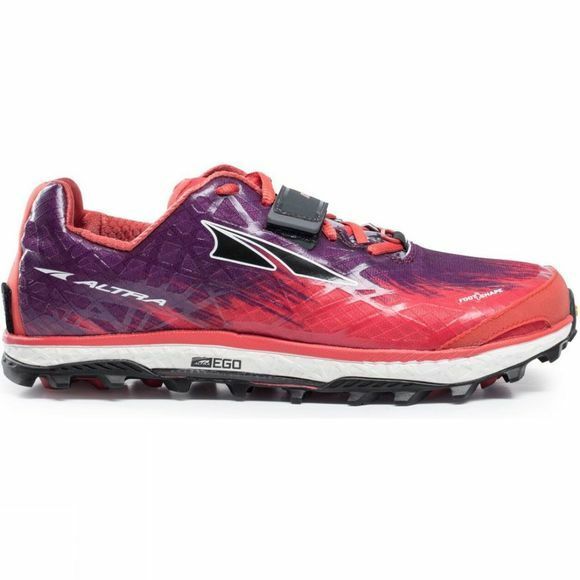 Above this gnarly outsole sits the Altra Ego™ midsole, an all-new Altra-exclusive compound which is lightweight, highly responsive and snappy. The flexible wrap-around StoneGuard™ gives you extra underfoot protection, while the supportive, TPU overlayed upper and durable Foot Lock Strap lets you adjust to perfection on-the-run, and doubles as a lace keeper.